Dr Alan Williams presented a very comprehensive overview of the TEAL website and practical components for teacher assessment. Anecdotes of the development of the site were given as was background information regarding the establishment of the tools and the collaborative nature of the resources. Alan suggested that the tools are adaptive to your cohort of students and/or institution for both Primary + Secondary schools. Alan articulated that the TEAL tools were established not only for supporting EAL teachers to assess their students’ language abilities but also for providing suggestions on how to support students with the next steps. The tools enable teachers to map their students’ progress over time and as such can be used in the collection of longitudinal data. Finally, Alan implored participants to be vocal in making suggestions to the TEAL creators on how they can further support teachers in their assessment. One suggestion was to upload student work samples through the ‘benchmarking forum’. This well attended morning session proved to be very inspiring to every participant, especially in relation to the effective use of digital technology for teaching EAL literacies to Year 7 refugee students. Within half an hour of allocated time, the presenters gave a well-planned glimpse of their collaborative action research into the trans-media storytelling as an innovative pedagogical approach. The enthusiastic audience responded with further queries and thanked them wholeheartedly for a fast paced but very informative session. 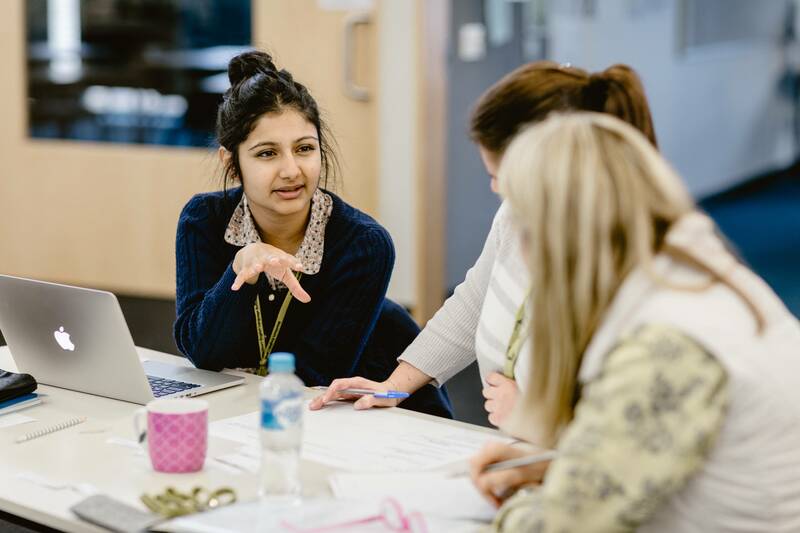 Experienced EAL teacher and leader Rosemary Abboud recounted her journey in establishing an EAL program for students at Dandenong North Primary School. From her very first questions about how language is learned, and what supports are required to do this successfully, we followed her through the thinking and planning involved at each stage, and heard what she had implemented to develop and build a differentiated and effective EAL support program. Along the way, she discussed leadership, sharing what she had learned through the process. Rosemary presented thoughtful insights and advice about building constructive relationships, developing opportunities and resourcing colleagues which will be particularly useful for EAL teachers working in mainstream settings, who are often set the task of developing similar programs, and frequently required to take on responsibility for the leadership of EAL within their own school. Rebecca Harris who is part of the Wellbeing Team at Carlton Primary School highlighted the findings from research into the impact of childhood stress and trauma on learning and behaviour. The practical ways that she suggested to teachers, who can employ trauma informed practice to students’ wellbeing and ultimately their learning, was sensational. For an hour, she kept us spell bound and shared very valuable resources too. How about teachers’ stress after working in this environment for long, was intriguing to many of us. But Rebecca proved to hold the fort strongly and empathetically, which is certainly exemplary. What a wonderful and thought-provoking session this was! Margaret shared her wealth of knowledge in the area of mentoring mainstream teachers on how to work with EAL students through the analogy of the fairy-tale Cinderella. This session covered the effective use of digital technology in relation to the synchronous teaching and learning via video conferencing. Voula MacKenzie aptly but briefly introduced the program. 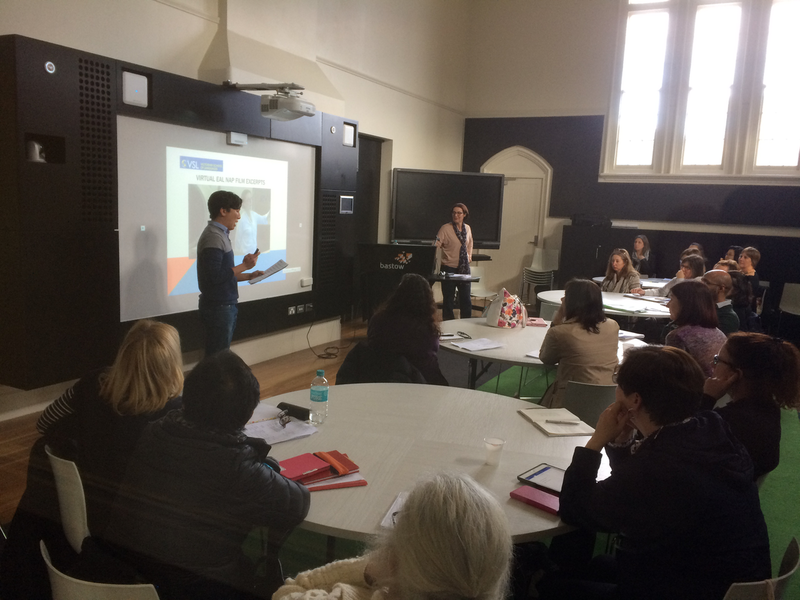 Following that, Nathan did an extensive presentation covering how the virtual EAL program for the new arrivals in the remote areas of Victoria is delivered through a distance education model at the Victorian School of Languages. The in-depth information on the components that make up the virtual learning environment effective and engaging, proved to be very stimulating for every participant. One does feel so humbled when listening to the important work that an EAL leader such as Mairead Hannan does. By reflecting on her own educational journey and musical and teaching career she provided the audience with a sensitive interpretation of living and learning as an EAL student in the St Joseph’s Flexible Learning Centre. She shared with us the tenets of the Maree Program – a flexible program run for 15-25 year old EAL learners who are disengaged or have fallen through the cracks in the educational system. On learning that the Berry St pastoral care model guided many of the practices and that the Edmund Rice Education Australia oversaw the Program, many of us in the audience were led to marvel at the noble and key social and educational role Mairead plays with her staff in supporting over 450 EAL learners so very much in need. Following recent settlement of refugee groups in the Bendigo area, the Loddon Campaspe Multicultural Services identified a need for everyday English classes, particularly for refugee women who were unable to access TAFE or AMEP programs because they were home caring for small children. In response, the Mums and Bubs English classes began three and a half years ago. At the VicTESOL Symposium, Robyn Spandonide and Ellie Akbari gave us an interesting insight into the program’s development and scope, and its positive impact on both the mothers and children, both in learning English, and more broadly in building confidence, connection and integration into the community. The effect of this program was a reminder to all sectors of the importance of knowing the community and responding in creative and practical ways to their particular learning needs. Most international students are already using social media for their own purposes, and many teachers try to harness this enthusiasm to increase connection within a class, with mixed results. Jade Sleeman’s session examined some case studies with students’ reactions to the use of social media in a class. She gave some tips on how to encourage constructive use of social media to increase class cohesion. Her research shows that guidelines and modelling are required from the teacher, but social media can have a positive effect on students’ sense of connection in a class. The Pronunciation workshop with Margaret Corrigan and Liz Keenan was an opportunity for participants to see in action some of the effective pronunciation strategies that are used at Carringbush Adult Education in Richmond. Teaching pronunciation is a challenging task but not for Margaret and Liz and their team at Carringbush! They both demonstrated their passion and dedication through their ongoing research, learning practice and effective collaboration in order to make a difference for their learners’ quality and active pronunciation skills. This workshop empowered participants to form meaningful discussions, share their experiences and prepare an action plan to upskill their pronunciation strategies in order to integrate them explicitly in their different domains. We started the day with a truly inspiring look into what an individual, with support from their institution, can achieve. Abhishek Awasthi shared with the audience the wonderful work he is doing at Kangan TAFE in finding new and varied ways to engage and connect EAL learners through sport. He explained the links he has forged with Cricket Victoria, Study Melbourne, the Victorian State Government and now Deakin University to provide wonderful opportunities for students to access professional sporting organisations such as Cricket Victoria in the form of clinics, excursions and orientation days. He has facilitated this as a means to not only help young EAL learners to access social and professional capital they would otherwise not have a means to tap into to but to also contribute to their health and wellbeing though physical activity and social interaction. His drive and passion for the project were palpable. In this talk I will trace the role of teachers of language into the sphere of planning and policy. While teachers can be active as policy influencers in their role as citizens and specialists in language and learning, they are policy planners in a more specifically professional way. Sometimes called educational linguistics I will describe some ways in which teacher talk, teacher language modelling and other classroom and communication practices represent language planning as much as language teaching. The aim is to support both individual teachers and teacher associations to think of themselves in leadership roles. As our communities become increasingly diverse in a cultural and linguistic sense, teachers and teacher associations need to become more aware and more assertive of the their unique perspective on the language development and therefore the social, personal and educational prospects of young learners and the resultant effects of new conceptions of citizenship, new forms of economy and new kinds of identity. Many of us enter the TESOL profession for the genuine joy of teaching English to EALD learners. The job, however, is much bigger than teaching English and the role of the EALD teacher is expanding to fit changing social and economic circumstances. In this presentation I outline the changing role of the EALD teacher, from being a teacher for our students to being an instructional leader for our mainstream colleagues and an advocate for our students and their families. I talk about the ways we can take on these new roles by connecting to the larger TESOL community and migrant services and communicating our messages clearly to the public. Embracing our expanding role is key to ensuring our profession not only survives but thrives into the future. In this presentation I will explore ways in which a rich view of the communicative repertoire can help to identify the resources that learners have and need for learning and life. I will use the Multiplicity framework (Nicholas & Starks 2014) to explore ways of answering questions about what “language” is and how it is learned in order to frame ways of thinking about and teaching English as an additional language for learners from the diverse backgrounds and with the diverse life purposes that we find in current learning settings. April Edwards shared her personal, exemplary journey from an EAL coordinator to the Teaching and Learning Leader at Thomastown S.C. by taking her passion and expertise for second language acquisition and pedagogy in this role. In this information packed, inspirational session Edwards highlighted the need to audit and identify needs of not only EAL but also NESB students that an educator can influence in one’s own context and advocated the process to follow. The handouts Edwards provided helped develop the comprehensive understanding of the points she was elaborating upon throughout the presentation. Edwards focused on the step-by-step progressive actions one can initiate in order to establish and foster a sense of belongingness to the school community among EAL/NESB students and their parents. Report contributed by Lini Kane, VicTESOL Committee Member. Jan Molloy and Liz Suda from Museum Victoria engaged us in ways of thinking about how we might use the Museum’s resources to develop cultural understanding. We were also inspired to consider the diverse contexts of the English language. In thinking about what a museum is and does, Molloy and Suda provided the following useful definition from Museums Australia: “A museum helps people understand the world by using objects and ideas to interpret the past and present and explore the future”. They demonstrated a few of the ways that Museum Victoria does this through the various programs and learning kits that they offer: e.g. What’s your story? First peoples, etc. Lastly, they reminded us that the Museum runs programs that are both on and off their sites, as well as online, making them an accessible and valuable resource for teachers and learners of language. Report contributed by Julia Lippold, VicTESOL Committee Member. 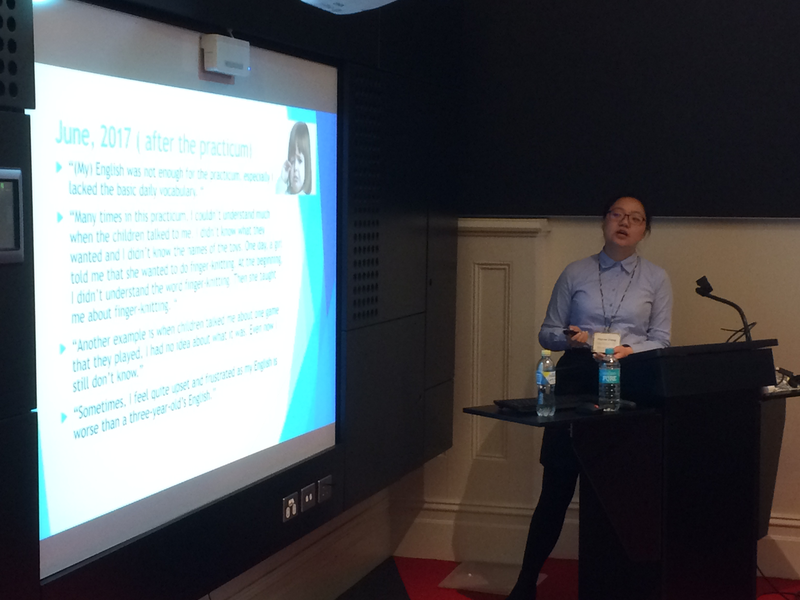 Angela Cincotta-Segi from Student Learning at La Trobe University used the context at her workplace to introduce us to student cohorts who reflect a wide range of language backgrounds and educational experiences. The rich social, cultural and linguistic diversity of students at universities makes for diverse learning needs and therefore programs for addressing these needs must be similarly diverse. Cincotta-Segi outlined the challenges in resourcing such programs. She presented a model for addressing the needs of whole cohorts through embedding of language and academic skill development within mainstream curricula as well as implementing support for small groups and individuals who need more intensive support. Report contributed by Shem Macdonald, VicTESOL Vice-President. Robyn Babaeff shared narratives from her research, describing the practical and emotional journey facing EAL students and their families. Through interviews she conducted with families of second language learners, she gave an insight into the expectations, fears and hopes that parents experience as their children become participants in a new culture, and the importance of teachers hearing and being responsive to these. Babaeff emphasised the importance of really seeing learners as bilingual – embracing the richness that it brings to the classroom, and addressing the challenges as well as the opportunities as students learn to “do self” in a new language and culture. 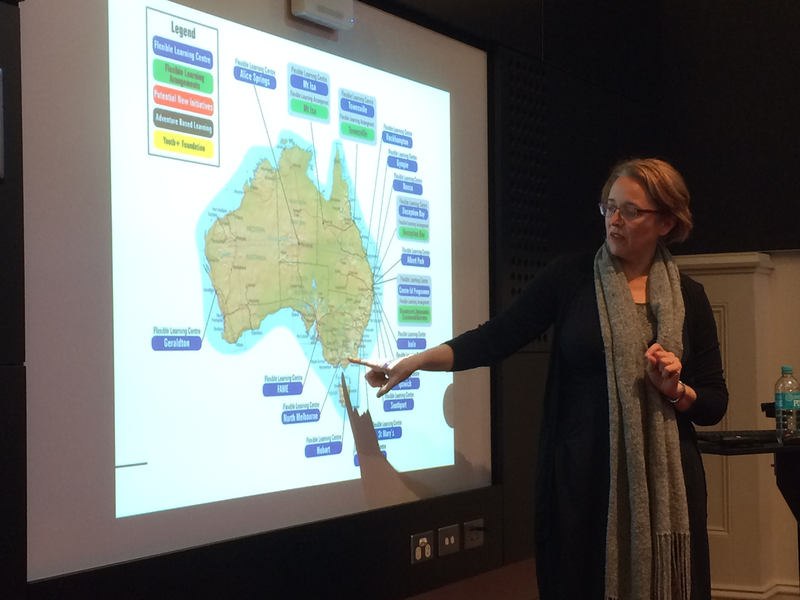 Report contributed by Michelle Andrews, VicTESOL Committee Member. The final session of the Symposium was a panel comprising Jenn Clark (Manager, ASRC Schools program), Anthony Brewergray (EAL teacher, Wodonga Senior Secondary College), Mairead Hannan (Head of Education and Careers, The Huddle), David Ogden (Wellbeing Team Leader, Dandenong HS) and Howard Kelly (Education Consultant). Panel members outlined a wide variety of locally relevant programs celebrating and educating about diversity and engaging with their unique communities. They discussed planning programs, meeting challenges and finding creative solutions for “making the most of … cultural collateral”, and shared the positive outcomes of their partnership and engagement projects, inspiring the audience to reflect on how they might implement projects in their own settings. Dr Nicholas’s presentation on EAL theory was insightful and invigorating. The common language acquisition notions of ‘communication’ and ‘language’ were unpacked deeply through presentation and group discussion. The complexity of communicative acts were further explained whilst Dr Nicholas presented his “Communicative Repertoire” theory. This four dimensional theorem essentially maps the choices individuals make when communicating in any context or situation; from purpose to varieties to modes and mediations. By asking ourselves what resources at available to us, with whom do we wish to communicate and what message do we intend to convey essentially we can map any communicate act.